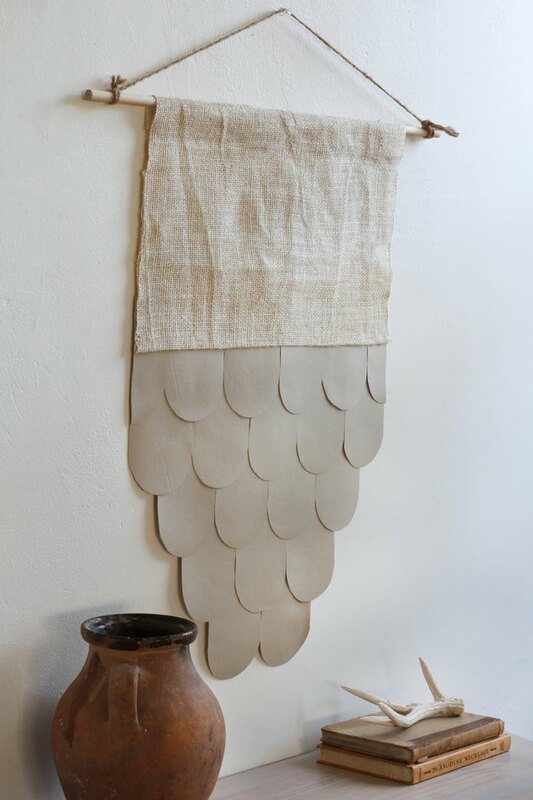 When you want to add texture to a wall, this DIY hanging is a perfect choice with its study of contrasts between a luxe fabric like (faux) leather and a natural fiber like burlap. 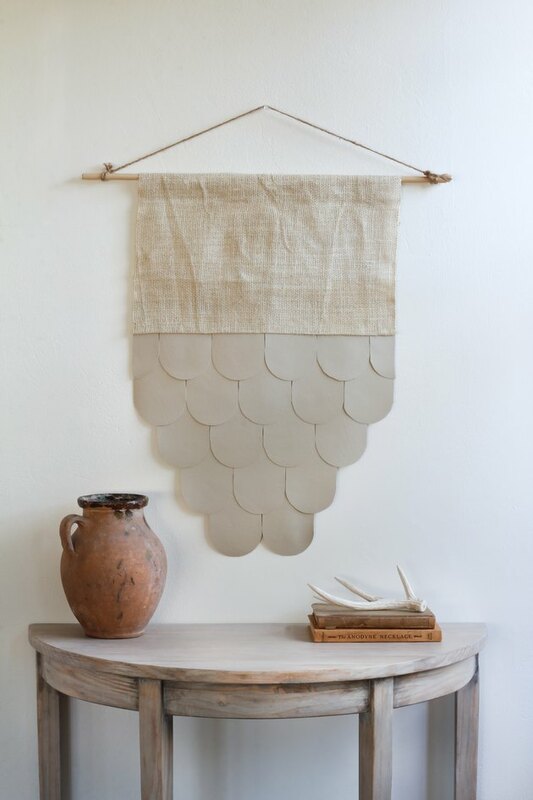 The scalloped detail creates visual interest, yet the tonal color palette keeps the pattern subdued, so it won't compete with any existing artwork or decor. It walks the line between being a little bit boho and a little bit minimalist, but one thing's for sure: it will add maximal style to your living space. 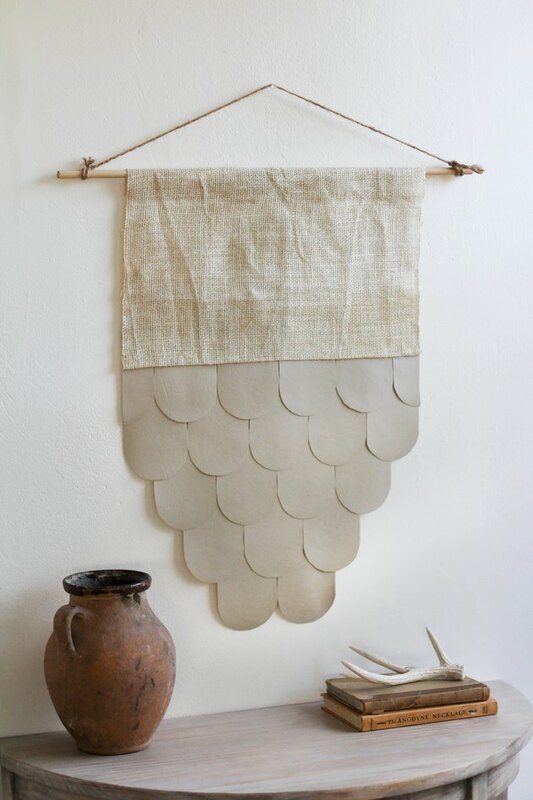 Download and print the free scallop pattern template. 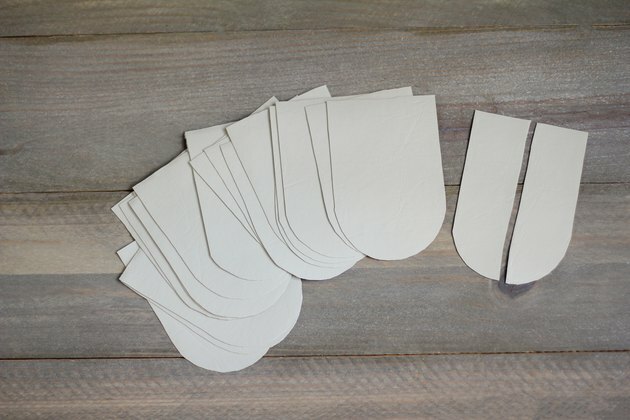 Cut out the template and attach it to the faux leather fabric with painter's tape. (Don't pin it because it'll leave holes in the fabric). 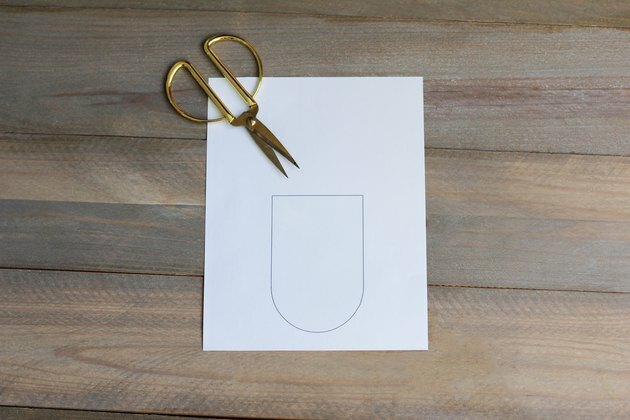 Carefully cut around the template with scissors. 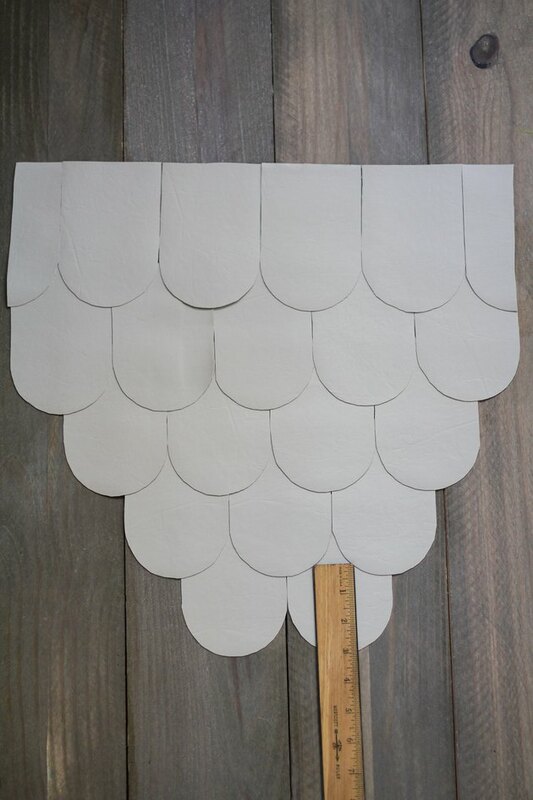 You'll need to cut out 25 scallop pieces, and then cut one of the pieces in half vertically. 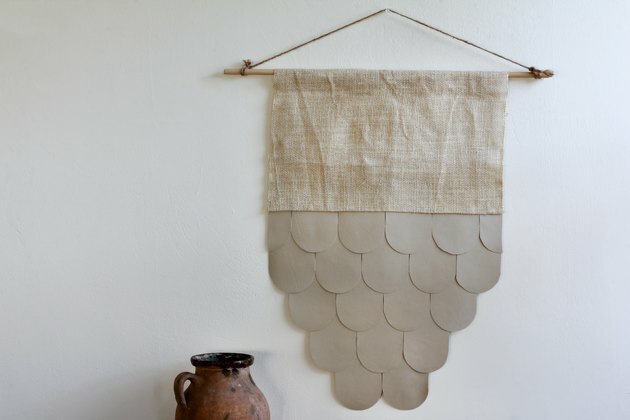 Lay out your fabric scallops, starting with a row of two pieces at the bottom. 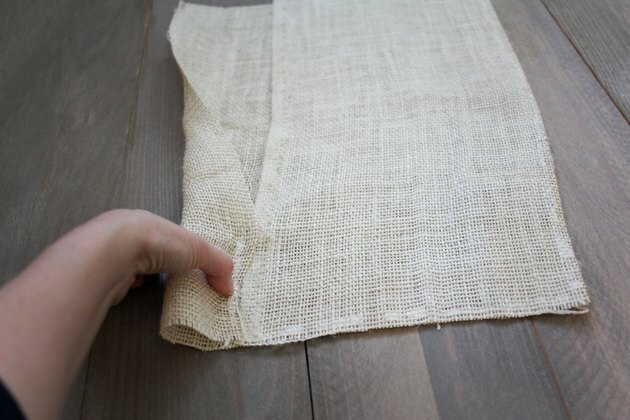 Place a row of three pieces directly on top, leaving three inches of fabric exposed on the row below. Continue with a row of four pieces, and then two rows of five pieces. The top row will have the piece you cut in half on each side. 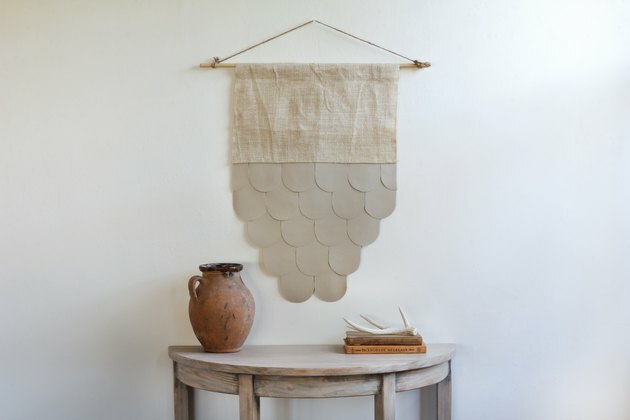 Be sure to stagger your rows to create the scalloped pattern. 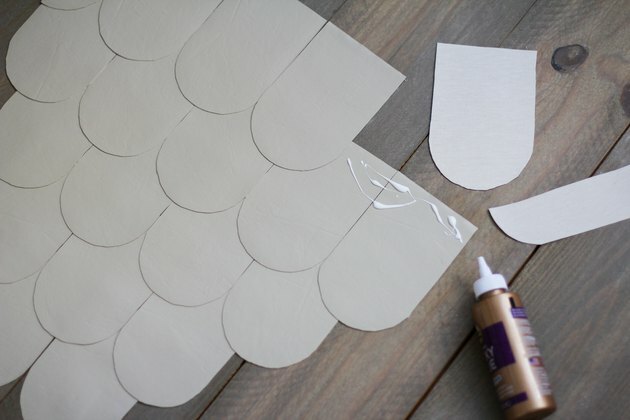 Glue the pieces in place using fabric glue, starting at the bottom and working your way up. Let the glue dry completely. 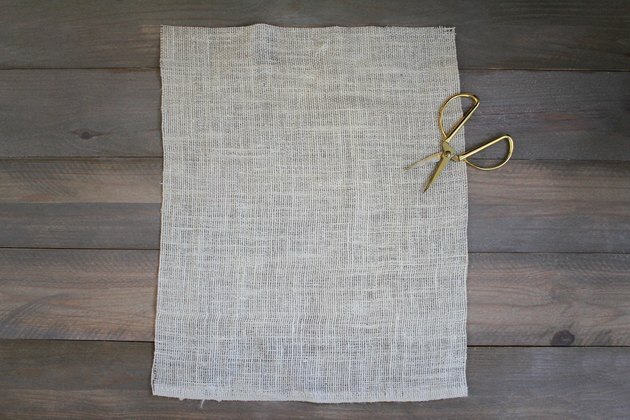 While the glue is drying on the leather pieces, cut a piece of burlap that is 18 inches wide by 22 inches long. 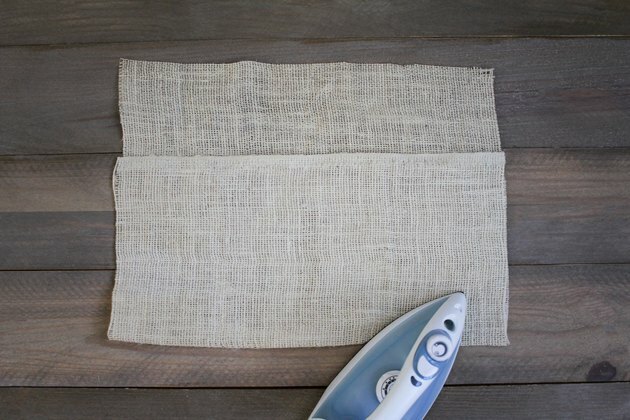 Fold up nine inches of fabric (on the 22-inch side), and iron it so the bottom crease is nice and crisp. Leave four inches of fabric unfolded at the top. 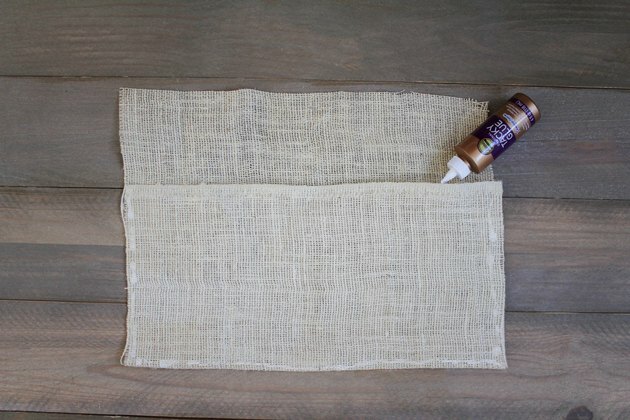 Then unfold it, and run a line of fabric glue along the bottom crease and sides where the two sides of fabric will meet. Now fold the fabric back up and press along the glue lines to secure the fabric together. 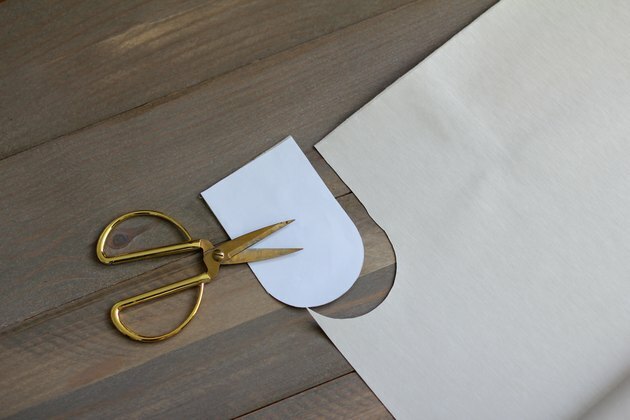 Also, glue along the top seam of the fold. 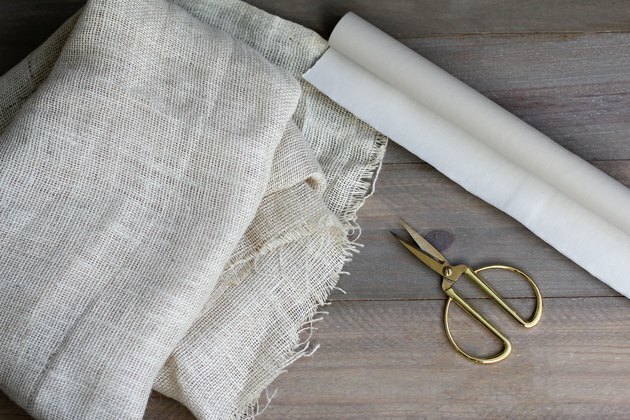 Fold the remaining four inches of fabric at the top in half to create a pocket for the dowel, and secure it with fabric glue. 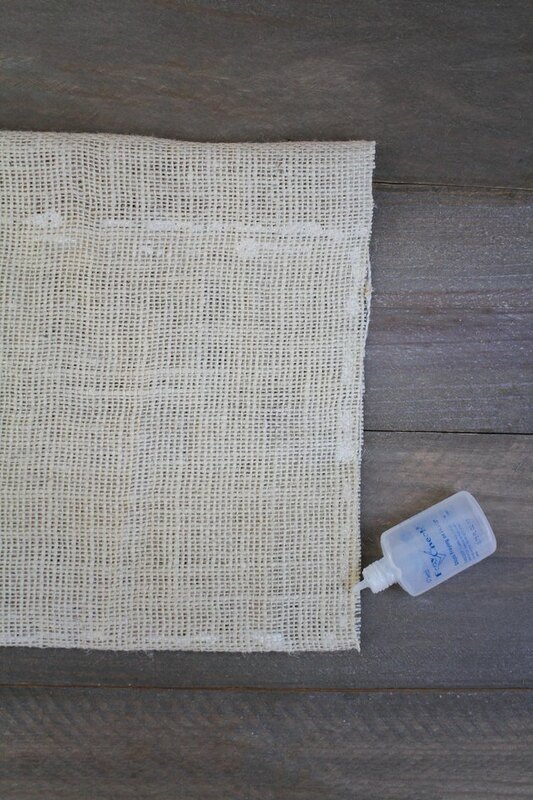 Trim away any fray pieces along the sides, and then coat the sides of the burlap with a liquid seam sealant to prevent fraying. You could also use clear nail polish. 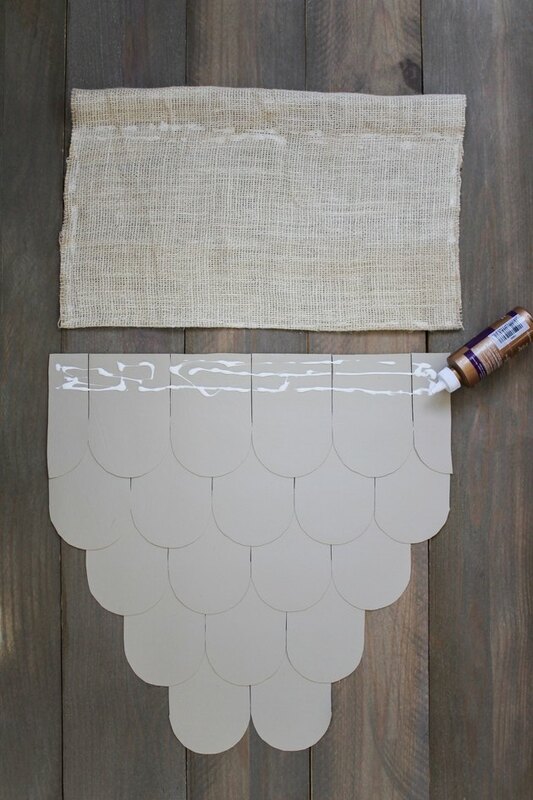 Glue the burlap front-side up to the top row of leather scallops, again leaving three inches of the leather scallops exposed underneath. 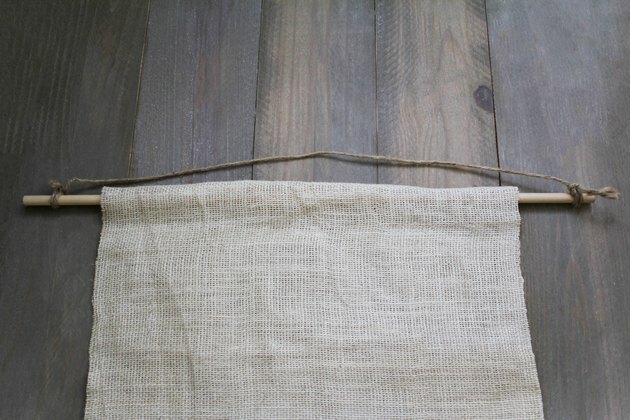 Slide the dowel through the pocket at the top of the burlap, and then tie a piece of twine or string on both ends of the dowel for hanging. 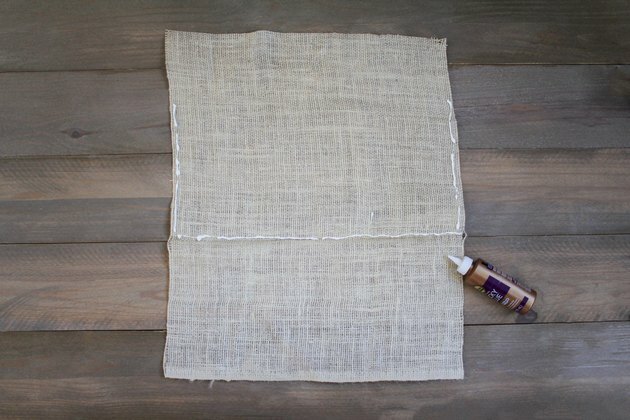 Secure the wall hanging to the wall with a tack or nail, and you're done!